Messerschmitt P.1110 (Me P.1110) was a design for a single seat high-altitude interceptor developed for the Luftwaffe by Messerschmitt aircraft manufacturing company under the Emergency Fighter Program during the last years of the Third Reich. As part of the Emergency Fighter Program (Template:Lang-de), at the beginning of 1945 a programme was launched by the OKL for a new generation of fighter/interceptor aircraft in order to replace the He 162 Volksjäger. The new aircraft was intended to have superior performance in order to deal with high-altitude threats such as the B-29 Superfortress. Messerschmitt designed a number of different high-altitude fighter projects which were submitted in February 1945. 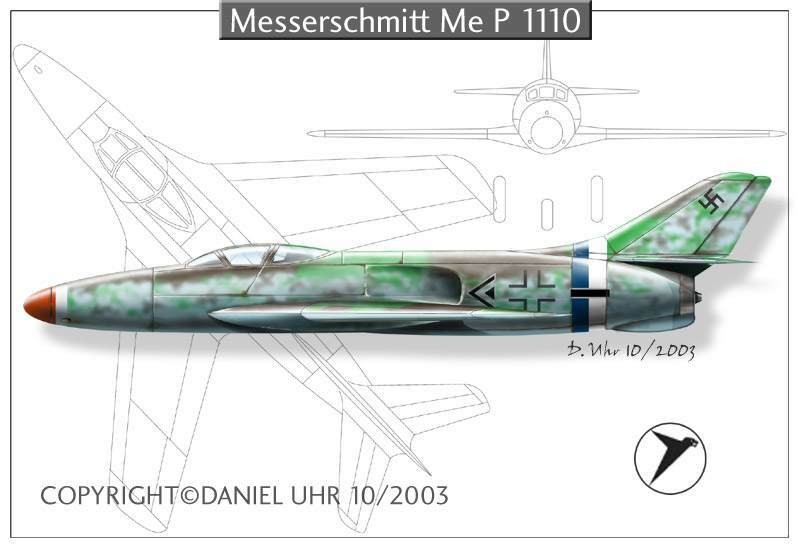 One of the designs, the Me P.1110 Ente (Duck), had a 40° wing sweep and annular air intakes in front of the wing root (akin to the North American YF-93), feeding a single Heinkel HeS 011A jet engine; the annular intakes, while flowing four percent less air, would suffer fifteen percent less drag than a single nose intake. The aircraft was to be armed with three MK 108 cannons in the nose, plus perhaps two more in the 40°-swept wings. There was a proposed butterfly tail variant, as well. Projected maximum speed was Template:Convert. The project would be soon dropped in favor of the more conventional other two, but in the end the Junkers EF 128 was chosen as the official winner of the competition and none of the Messerschmitt designs made it to the prototype stage. The designs brought forward by other German aircraft makers were the Heinkel P.1078, the Focke-Wulf Ta 183 and the Blohm & Voss P 212. A development, the P.1111, with wing-root intakes to overcome the power losses (a concept later adopted by the Republic F-105 Thunderchief) and 45° sweep, was prepared in January 1945, but never built. The Messerschmitt P.1110 project had at least three different versions. All of them were single-seat fighters with swept wings. The wings were swept back at 40 degrees and included mostly wood in their construction. All of the projected aircraft would be powered by a single Heinkel HeS 011 turbojet. Jet-powered interceptor. It was a conventional-looking design with the turbojet air intakes located on the fuselage sides. Its armament was three MK 108 cannons located in the nose, as in the following variant. A V-tail jet-powered interceptor with a conventional-looking design. The air intake of the engine was of an annular shape located behind the cockpit. Like the Me P.1110/I, the Me P.1110/II had 40 degree swept-back wings. The Me P.1110 "Ente" (Duck) was a more unusual interceptor project with the cockpit located at the nose end of the plane. It a canard configuration with small wings in the front and larger wings in the rear part of the fuselage. Its air intakes were located on the fuselage sides like in the Me P.1110/I variant. Its armament was four MK 108 cannons. ↑ Christopher, John. The Race for Hitler's X-Planes (The Mill, Gloucestershire: History Press, 2013), p.162. ↑ Christopher, John. The Race for Hitler's X-Planes (The Mill, Gloucestershire: History Press, 2013), diagram p.161. This page was last edited on 20 June 2014, at 01:05.